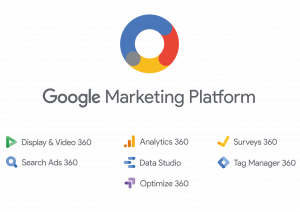 A platform enabling the implementation of marketing activities in various channels and of diverse character in support of and as measurement of the client's path. It provides access to a set of integrated advertising and analytical tools. A key analytical tool for studying user behaviour and measuring the effectiveness of websites and mobile applications. The tool allows you to improve the effectiveness of the site by implementing experiments with its different versions. It can also be used to personalize the landing page of the campaign. A tool enabling the implementation of analytical and marketing tags. It ensures easy and quick tag management without having to edit the source code of the page. Workspaces, catalogues, versions, rights management, etc. facilitate the administration of tags while maintaining the order and security of the site. Demand Side Platform for running and managing campaigns in the RTB model or using other forms of purchase such as Preferred Deal, Private Auction, Private Guaranteed. A platform for effective management of campaigns in search engines. It allows for fully automated CPC bid optimization. A convenient tool for reporting and visualizing data from various sources. It allows you to efficiently build clear and aesthetic reporting panels and easily share within the organization.